Captivatingly created from 18ct white gold, this beautiful ring features a solitaire 0.30ct centre round cut diamond, presented within a classic claw. Set to shimmer with every movement, this ring bears bare shoulders to let the diamond take the complete spotlight. A gorgeous ring sure to capture hearts. The total diamonds amount to 1/2ct on this ring. 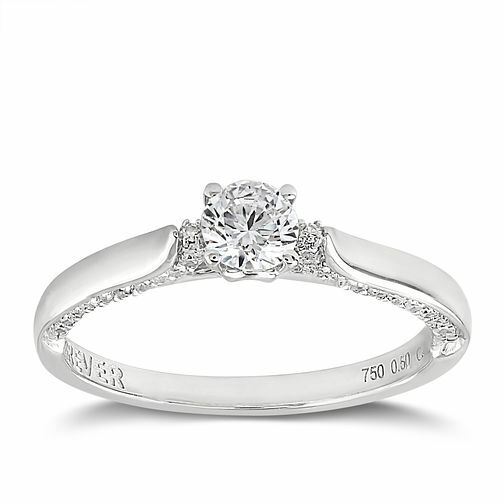 Forever Diamond 18ct White Gold 1/2ct Solitaire Diamond Ring is rated 5.0 out of 5 by 1. Rated 5 out of 5 by Anonymous from Overwhelming peice of jewlary At first I was very nervous buying my engagement ring online. I was very pleased when I seen the the piece could be returned if not happy. So I took the risk and WOW!! I certainly will not be sending it back. Very well presented box and well packaged for the postal duration. Also HSamual did very well with changing the address after the first posting did not reach me "my fault" so thankyou for the great service and fantastic, beautiful ring.